Global superstar Craig David and his full live band will perform at Colchester Castle Park, on Sunday 2 June, bringing an arsenal of hits and his signature dynamic performance to his only full concert in Essex in 2019. He will be joined by international DJ Sigala, who will be bringing a live full band set, following a smash hit performance from chart-topping artist and songwriter Becky Hill. And getting the crowd into the party will be the rising star DJ Nathan Dawe. In the wake of massive success of his 2018 tour, Colchester will form part of a limited number of concerts across the UK in the summer of 2019, bringing Craig’s warmth and a phenomenal live show that includes the all the hit singles such as 7 Days, Walking Away, When the Bassline Drops, Nothing Like This, Heartline and I Know You. Craig Davidhas sold 15 million albums worldwide, has had many Brit and Grammy nominations and is a multiple Ivor Novello and Mobo Award winner amongst others. His last two albums were both critically acclaimed and massive hits – with Following My Intuition at Number One and The Time Is Now reaching Number Two. It is 18 years since his debut album, the critically acclaimed Born To Do It, was at Number One, and he continues to amass fans across the globe. Sigala is a DJ and record producer who has enjoyed huge chart success internationally, with six singles in the Top 10 UK charts, including the huge Number One hit Easy Love. The songwriter,whose real name is Bruce Fielder, has worked with some of the most exciting artists in the world, collaboratingwith Sean Paul/Fuse ODG/Kent Jones, DJ Fresh, Kato, Digital Farm Animals, Ella Eyre, John Newman and Nile Rodgers and of course Craig David. Six platinum singles, eight gold singles, four million UK sales and eight million worldwide not to mention 800 million Spotify streams have propelled him to the most played British male on UK commercial radio. Sigala will be bringing a dynamic full live band set including these hits to Colchester ahead of Craig David’s performance, promising to have the crowds fully raring to go. 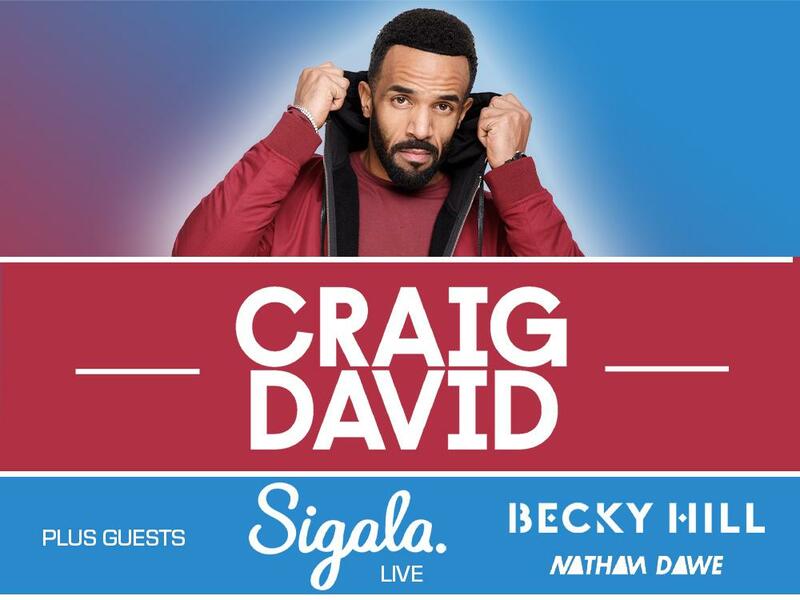 Having worked with Craig David on Aint Giving Up Sigala is the perfect choice of very special guest. Multi-genre DJ and producer Nathan Dawe has had an incredibly impressive 2018, with sold out December shows in Birmingham and London, succeeding his fully packed summer which included his yearly residencies in Zante and Ayia Napa, shows in world top clubs such as Ushuaia Ibiza, all through to his new release Cheatin on Atlantic Records, which has amassed nearly three million streams and entered the Official Top 100 Charts.